On the heels of North Texas came another "breather" for the Tigers, who moved up one notch to #6 in the AP and USA Today Coaches polls. Appalachian State from Boone NC had been a consistent power in the Southern Conference in 1-AA football (as it was called before the term Football Champion­ship Subdivision was inaugurated by the NCAA several years later). 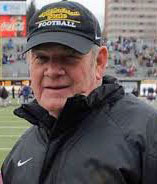 Coach Jerry Moore came to Baton Rouge with a 134-66 record since he took over in 1989. 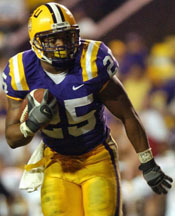 His 2005 squad was ranked No. 7 in the I-AA poll. Their two losses in eight games had come at Kansas by a 36-8 count and 34-31 to Furman, the No. 1 ranked team in the I-AA ranks. The Mountaineers were led by the QB-RB combo of senior Richie Williams and sophomore Kevin Richardson. 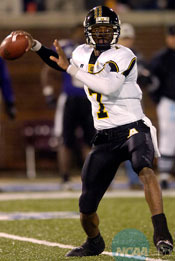 Williams, a top candidate for the Walter Payton Award given to the top player in I-AA football, was Appalachian's all-time leader in passing yards and total offense. 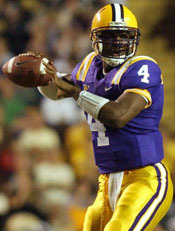 He averaged 221.9y passing and 300.4y of total offense per game. Richardson led the Southern Conference with 137.2 all-purpose yards per contest. Coastal Carolina Coach David Bennett praised the ASU QB. Richie Williams is probably the Michael Vick of I-AA football. You're not going to stop him. You have to try to slow him down a little bit and score a lot of points to stay in the ballgame. Wofford coach Mike Ayers: Williams is a playmaker. Even when plays look like they will be bad for them, he creates good stuff. Coach Moore had won five games against I-A opponents with all of them coming at the expense of Wake Forest. 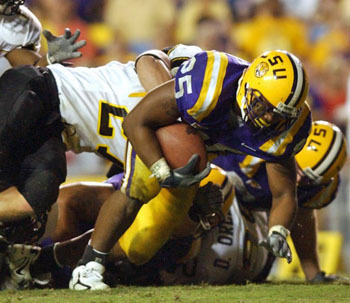 Appalachian State faced the same problem as other Tiger opponents in 2005 - lack of hotel space in Baton Rouge because of the influx of Katrina refugees. Moore explained after the game what his team went through that day. When you think about leaving Boone at six o'clock in the morning, we actually left at seven to go eat breakfast at the training table, and then we took a bus to Greens­boro, caught a flight out of there and got into here around one o'clock. The hotel we stayed at fixed us some places to lie around, some banquet kind of rooms. The players watched TV till three, central time, and then ate their pre-game meal. 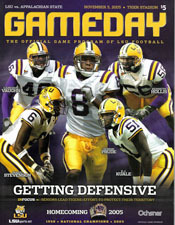 The game would be the first LSU contest of the season that would not be televised. A homecoming crowd of 91,414 saw a lackluster performance by their Tigers that saw the visitors outgain the home team on the ground. Dwayne Bowe tries to elude a tackler. The Mountaineers responded by moving the ball rapidly across midfield thanks largely to a 20y 1st down pass from Williams to WR Jermaine Little. 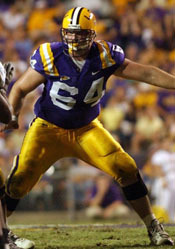 But the advance stalled at the LSU 45. After forcing a three-and-out, ASU took over on their 12. On 3rd-and-17 from the 5, Williams showed why he was one of the top players in I-AA. He broke through the blitz and raced down the field for 35y. But the Mountaineers didn't go past midfield and punted. Starting from the 20, LSU doubled its lead. Justin Vincent toted the leather six times for 58y. The Tiger defense stopped ASU and forced a punt. However, a holding penalty on the kick made it 1st-and-10 on the 35. The Mountaineers reached their 49 before they had to punt. 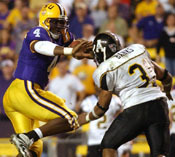 After another exchange of kicks, the Tigers moved across midfield on a 21y Rus­sell-Bowe connection to the ASU 45. But three incompletions led to a punt. The Mountaineers drove 36y to midfield as the half ended. Chase Pittman tries to tackle Richie Williams. If the fans expected the Tigers to explode in the second half, they were disappointed. Q3: When ASU couldn't move with the kickoff, the Tigers drove to the 21 before stalling. Chris Jackson tried a 38y FG but the boot fell woefully short, landing in the North EZ as many in the thinning crowd groaned. The Mountaineers then mounted their most productive advance of the evening. Instead of stalling near midfield, they kept chugging to the 15 where Ronnie Prude dropped Williams for a loss of a yard on 3rd-and-4. That gave PK Julian Rauch a chance to break the shutout. But - shades of the Auburn game - his 33y kick bounced off the right upright with 3:19 remaining in the period. Just as they did late in Q1, the Tigers started a TD march that carried over into the next period. 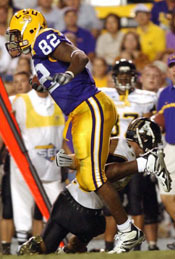 Russell started with an 18y aerial to TE David Jones and later hit another TE, Keith Zinger, for 22 to the ASU 30. Justin Vincent struggles for yardage. Trey Elder came in at QB for the Mountaineers and played the rest of the game. With both teams running the ball, the remaining time expired quickly. 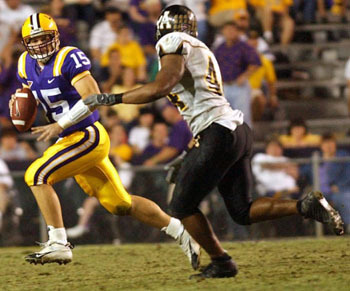 Matt Flynn quarterbacked LSU's last series. Matt Flynn avoids a rusher. Miles: I told our team that I thought we were in an awkward position in the fact that we played North Texas, a Division 1-A team, and had success and really manhandled - maybe beat them too easily. Then we had a really good Division 1-AA come in and the idea that we play another opponent thereafter that's very important on our season. I tried to let this team know that this team that we're playing is a good football team. It didn't make any difference what division they're in. They have all the ingredients -- offense, defense and special teams. They have a great quarterback, a great scheme. I thought we played well. I thought that considering it was not the emotion that we'll need in a week, it was a good outing. There were some things we did better, some things that we need to get better at. But overall, it's what we needed and we look forward to next week. We promise you it's been very difficult not to look to the next opponent. Justin Vincent: We started off a little shaky. We came back in the second half and I think we did a little better. We came in at half time and the coaches showed us what we needed to get corrected and I think we did that. DT Kyle Williams was happy with the shutout. It's good, first one of the year. We haven't had an opportunity to do that yet. I'm excited we held them without any points, but I wish we would have played a little bit better, a little bit sharper. I think everybody was trying to peek ahead [to Ala­bama], but we played well enough to win so that's good. Coach Moore: The place to start is to tell you how proud we are, the way that our people played ... When you put that [the trip that started at 6 that morning] all into perspective, and how they played tonight against the sixth or seventh ranked team in the country, we don't get into this kind of environment much, and I'm not sure that we probably didn't feed off that some. I am really really pleased, really proud of the way we played. I will say this, LSU couldn't be more complimen­tary, their staff, their players, the seven or eight minutes that you spend out there on the field after the game, they couldn't be more complimentary. 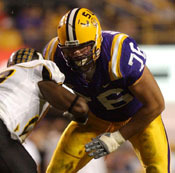 Williams commented on ASU outrushing LSU 176-163. It's a big accomplishment. We played hard, especially our offensive line. We really ran the ball well. We just had some problems getting in the red zone. On the team's feeling at halftime: We felt like we were still in this thing. We felt like we had to fight harder and try and put some points on the board. They just outlasted us. They are a great football team. 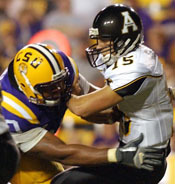 Appalachian State went on to win the 2005 Division I-AA championship, gaining revenge on Fur­man in the semifinal before toppling Northern Iowa in the final. Two years later, the Mountaineers would pull off one of the greatest upsets in history when they defeated Michigan in the Big House 34-32.